Makira Natural Park (MkNP) and Masoala National Park (MNP) in northeastern Madagascar span more than 2,400 square miles, making the region one of the largest remaining intact blocks of rainforest in Madagascar. The forests contain at least 22 lemur species, nearly a hundred bird species, and thousands of plant varieties, many of which are found nowhere else on earth. About 50 percent of Madagascar’s and one percent of the world’s unique floral biodiversity exists within the greater Makira and Masoala landscape. The forests provide critical corridors which allow wildlife to travel between adjoining protected areas and outlying blocks of forest. Makira and Masoala provide vital ecosystem services, such as clean water, food, and materials to the nearly 300,000 people who live in and around these forests. Access to reliable and affordable sources of protein for the communities bordering MkNP and MNP is currently limited. This situation results both in nutritional problems for children – such as iron deficiency anemia that can lead to developmental delays - and in increasing levels of hunting of critically endangered lemur species as households search for alternatives to purchasing meat at markets. Comprehensive research into the dynamics of bushmeat hunting in and around MkNP and MNP indicates that most hunting is for subsistence purposes and that very little is sold. 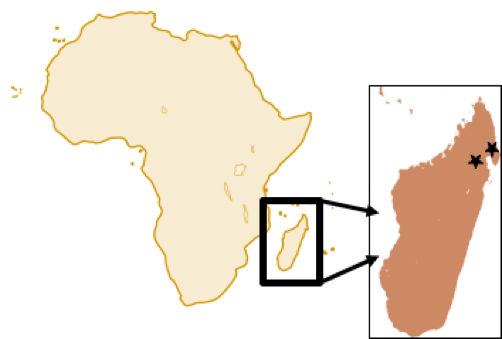 Further taste preference analysis with local communities indicates a preference for poultry over bushmeat. Village chickens are abundant in the area surrounding MkNP and MNP but poor husbandry skills and epidemics of Newcastle disease (ND) regularly decimate stocks and dissuade investments in better poultry management by villagers. Increased availability of chickens and eggs through ND vaccination and husbandry improvements may reduce the dependence on bushmeat hunting by providing a reliable, nutrient-rich alternative. In 2008, we were asked by Dr. Chris Golden of Madagascar Health and Environment Research (MAHERY: http://www.mahery.org) to come to MkNP and assess the constraints to chicken production, with long-term goals of providing a consistent source of nutrition and income to local communities, and of decreasing bushmeat hunting. In 2011, after sourcing funding through grants and private donations, our team visited three communities in the MkNP to study the poultry production system and investigate its major constraints. Through participatory exercises, and health and husbandry evaluations, we determined that the main problem with chickens was Newcastle disease (ND). Our findings in MkNP communities were consistent with the situation in MNP communities, and so we concluded that ND was also the main constraint to chicken production in these communities. Newcastle disease (ND) is a viral disease that is widely considered the most important poultry disease worldwide and is best controlled with vaccination. In the absence of a vaccination program there are husbandry and biosecurity practices that communities can follow to reduce the risk of introduction of ND virus or to reduce its spread once it has arrived. The thermotolerant ND vaccine I-2 ND is ideal for use in rural environments because it doesn’t need refrigeration and can be administered to all age groups by eye-dropper. To achieve maximum efficacy, the I-2 ND vaccine must be repeated every four months. Unfortunately, the vaccine was not available in Madagascar at the onset of this project. In January 2016, after sourcing additional funding, we organized a vaccine production workshop at Institut Malgache des Vaccins Veterinarire (IMVAVET), the national veterinary vaccine laboratory in Antananarivo, and this workshop led to the production of the first batch of I-2 ND vaccine and confirmation that it met international standards. The success of the ND control initiative rests on community investment. Community participation is critical for the program to eventually be self-sustaining and self-driven. Integral to this objective is the recruitment of prominent members of each village to fulfill the role of Community Vaccinators. Community Vaccinators are trained by regional Master Vaccinators and are responsible for promoting community awareness of upcoming ND vaccination campaigns and also tasked with sale and administration of the vaccine. Oversight of the regional campaign falls to the Master Vaccinators, who assist and coordinate the vaccine campaigns around MkNP and MNP. The Master Vaccinators are also responsible for data collection and reporting trends in community receptiveness to the vaccine program as well as fulfillment in meeting short and long-term goals. In February 2016 our team conducted a three day Master Vaccinator training course at IMVAVET in Antananarivo. Participants learned how to handle and examine chickens, handle and care for vaccine, use eye-droppers to administer vaccine, and train Community Vaccinators. The sixteen workshop attendees were selected by in-country project team members and included Antananarivo-based staff from IMVAVET, people working with conservation oriented NGOs, church leaders and village vaccinators currently working with alternative vaccines. 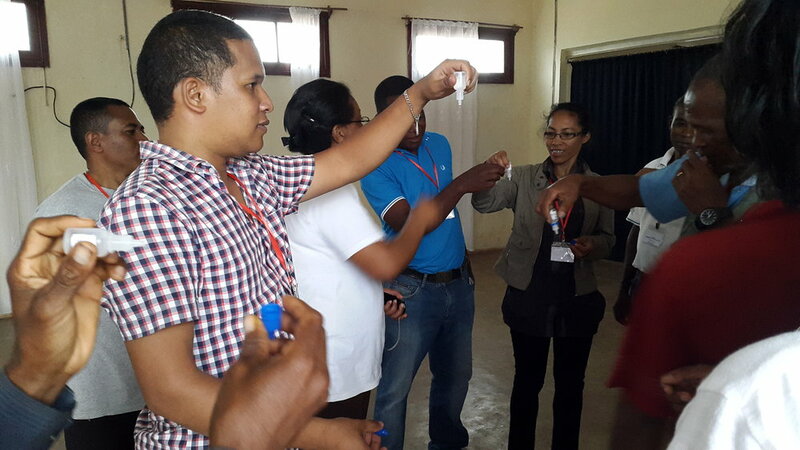 A subsequent Master Vaccinator training course was held at the Wildlife Conservation Society (WCS) facility in Maroantsetra, Madagascar. Refresher training is provided for Community Vaccinators prior to each vaccine campaign. In May 2016, our project team conducted the first ND vaccine campaigns in three communities situated around MkNP and three communities around MNP. The vaccine campaigns in each community were lead by a Community Vaccinator and occurred over two to three days. Community Vaccinators purchased the 250 dose vaccine vials for 7,000 ariary each (~$US 2.33) and then charged farmers 100 ariary per dose (~ 3 cents US), keeping the net as compensation for their effort. Most vaccinations were administered at the homes of the chicken owners. Over the course of the vaccination campaigns in the six communities, 1,971 vaccine doses were administered. Vaccine campaign have occurred every four months since the first campaign, and as of October 2018, nearly 14,000 doses had been administered. Objective data on chicken and egg production, ND epidemic resistance, and wildlife consumption are not yet tabulated, but generally farmers are reporting that their vaccinated chickens seem healthier and more robust. It is exciting to see that vaccination has been accepted by many farmers though differences in acceptance and compliance between communities have been noted. Vaccine campaigns are continuing to occur every four months and there is ongoing collection of data to assess the effectiveness of this chicken health initiative. We are grateful for financial support from the Norvig Family Foundation, the Saint Louis Zoo WildCare Institute, the San Francisco Zoo Conservation Committee, the Wildlife Conservation Society, Yorba Wines, and our generous private donors.